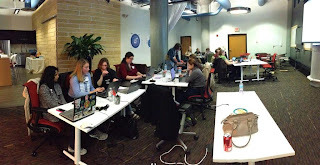 Announcing the first Dayton Python Workshop for women and their friends, April 5-6, 2013! The Workshop is a free, friendly, hands-on, beginners' introduction to computer programming. In one short weekend (a Friday evening and a Saturday), participants get a real handle on programming for practical tasks, using the easy yet powerful Python language... while having a fun time with new friends! The primary target audience is women of all ages and backgrounds, including those who have never programmed before. Men can participate as the guest of a female attendee - that's where the "women and their friends" part comes in. If you're a man who wants to take part, ask a woman you know to join you. Don't underestimate the power of a personal invitation - you'll never know which of your friends just needs a nudge to try it until you give her that nudge. We'll enjoy food and a great venue at New Horizons in Fairborn. Hooray for Columbus Python Workshop 1! The first Columbus Python Workshop for women and their friends was a success! We had about 18 students from all sorts of backgrounds, plus TAs Alyssa and Ryan from the Central Ohio Python User Group. They dived in with a will and learned an amazing amount in a short time. We all had fun and I loved having them there... there's something uniquely wonderful about teaching to faces that are smiling at you. By the end, we had several nice variants on the Color Wall. Food sponsorship by LeadingEdje kept us all nicely fed and caffeinated, and Pillar provided The Forge, its new creative workspace in the Short North. ... and we're expecting to see a bunch more at the next Central Ohio Python User Group meeting on Monday. My experiment with running the exercises through IPython Doctester rather than CodingBat was... partially successful. Many students had to fall back on CodingBat thanks to trouble installing pyzmq on Windows. So I know some improvements to make for next time around. To get involved with our next workshop in Columbus, sign up for the Central Ohio Python User Group. The next Ohio workshop, though, will be in Dayton... home sweet home at last! If you came to the workshop, I would love for you to stay in touch, to ask questions or for any other reason. Thanks to all the students, the sponsors, and to the Boston Python Workshop for leading the way!